The community of Jardim Colombo is a neighborhood of 20,000 inhabitants located 7 miles to the West of São Paulo’s city center. It has been witnessing for the past 15 years the turning of Fazendinha, a 1,000 square meter piece of land that used to be a little farm, into a huge dumping site. Jardim Colombo is an urban fabric with high density, and Fazendinha is currently the only large open space available for public use. However, its transformation into a dump has prevented Fazendinha from being considered for any alternative use. For this reason, almost a year ago, the community leaders Ivanildo de Olivera and Ester Carro, with the support of ArqFuturo, began considering transforming this huge dumping site into a park for the community. Between December 2017 and January 2018, a collective cleaning process took place in Fazendinha and ended up with the filling of 40 tracks with rubble. Despite this huge collective effort, Fazendinha continued to accumulate trash, causing despair in the volunteers working on the site. Would the creation of a new park actually ensure that the neighbors of Jardim Colombo take care of it? How should the project be addressed to foster this change in behavior? Moreover, could this transformation process become a way of strengthening the community to pursue other goals beyond just the physical construction of a new park? Those were some of the challenges that we faced when I arrived to Jardim Colombo and met Ester during the first week of June 2018. Beyond the physical transformation of Fazendinha, we also realized the need for developing a cultural programming for the community. In time, we came up with an idea that could eventually bring these two goals together: the organization of an art and participation festival in the dumping site. The objectives were twofold: first, generating expectations about the huge potential of Fazendinha; and second, engaging the community with the design process of their future park. 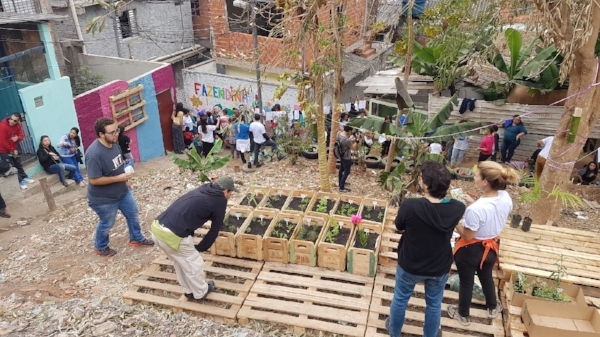 Prior to the festival, we organized several workshops on image design, carpentry, pot design, photography, and landscaping, in order to start engaging more community members from Jardim Colombo and spreading the word about the Fazendinha Project. The proposal generated expectations from the people both from inside and outside the community, and the network of volunteers expanded dramatically up to over 30. In the meantime, we raised funds, collected donations, continued with the cleaning of the dump and designed a temporary architectural intervention to accommodate the activities planned for the big day. The first art and participation festival of Jardim Colombo took place on July 22, 2018. In the morning, volunteers coordinated several workshops—recycling, origami, participatory design, community gardening, decoration, and graffiti. After a massive community lunch, various street performances took place in the afternoon, including a one-hour theater play. The event finished with a music show in the central platform of Fazendinha together with everybody celebrating the transformation of the space. The festival was only the first step towards what could become a deeper and long-lasting transformation of Jardim Colombo. Since then, many more events have taken place—including a women festival, a graffiti festival, and capacity building. Moreover, the design of the park, based on the ideas accumulated during the festival, has moved forward into its next stage—there is now a formal project proposal—along with new landscaping interventions in Fazendinha. The network of people contributing to the project is continuously expanding, and most remarkably, neighbors of Fazendinha have stopped throwing trash into the site: the temporary intervention that was designed for the first festival still enables the space to be used for different activities three months later. Beyond the main goal of the project—the physical transformation into a park—the process has become an important example of urban pedagogy. The Fazendinha Project contributes to the expansion of the community’s conscientização (Freire, 1968) around its current situation and its potential to overcome certain structural challenges. Every new event that is organized increases the community’s capabilities to both define and pursue the goals “they have reason to value” (Sen, 1997). There are certainly a number of uncertainties around the project, and only time will tell if Jardim Colombo is experiencing a real shift in its mindset, but, so far, the culture-oriented approach that we adopted and implemented is filling us with hope.